If Republicans obstruct Obama, the next Democratic president can shape the most progressive court since the 1960s. Healthcare, gay marriage, voting rights, affirmative action, reproductive rights, labor rights, immigration, climate change. These are some of the crucial issues that have come before the Supreme Court in recent years or will be heard this year. A cliché we hear every presidential cycle is that the Court should be one of the most important issues in the election, but this year, following the death of Antonin Scalia, it’s never been truer. The next president will almost certainly appoint one or more justices, especially if Republicans zealously oppose whomever President Obama nominates, who will shape the direction of the Court for decades. A Democratic successor to Obama would be able to achieve the first liberal Court since the Warren Court of the 1960s. Conservatives have long understood the power of the courts and made wielding it a key priority. Opponents of the Voting Rights Act, for example, tried for decades to weaken the law by pushing Congress not to reauthorize the act and for conservative presidents to gut it. When that strategy failed, they turned to the courts. Presidents like Richard Nixon, Ronald Reagan, and George W. Bush ushered in a sweeping counter-revolution in the law by appointing justices such as Scalia, William Rehnquist, Clarence Thomas, John Roberts, and Samuel Alito. Starting in 1981, Bruce Fein, an assistant to the deputy attorney general, organized a White House–Justice Department Judicial Selection Committee, chaired by White House Counselor Ed Meese, to interview and screen prospective candidates for the bench. The effort grew in prominence during Reagan’s second term, when Stephen Markman, after serving as Senator Hatch’s counsel and the Washington director of the Federalist Society, became head of the Office of Legal Policy. Reagan put in place “the most thorough and comprehensive system for recruiting and screening federal judicial candidates of any administration ever,” Markman said. Progressives, in contrast, have often neglected the importance of the courts. Many on the left argued there was little substantive difference between Bush and Al Gore in 2000, even though Gore would’ve appointed justices very different from Roberts and Alito. 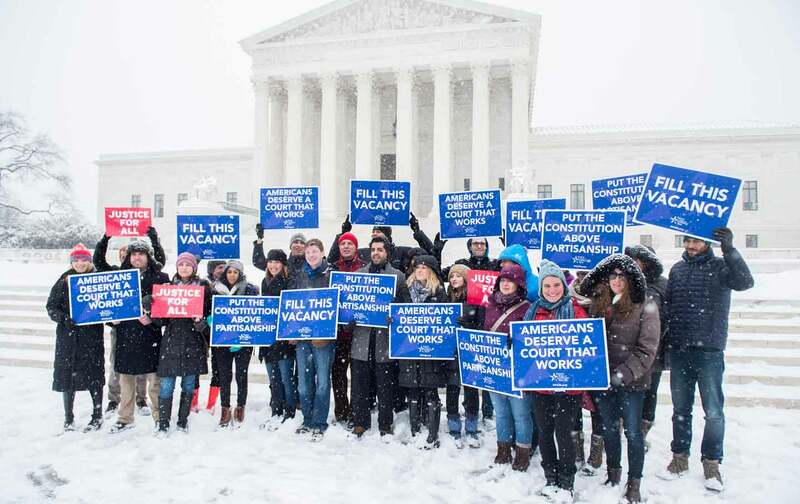 The Court has become a bigger cause for progressives following devastating rulings like Citizens United and the gutting of the Voting Rights Act, but the conservative base is still more passionate about the issue than the Democratic base. Hopefully that changes in 2016. The Roberts Court has made it easier to buy an election and harder to vote in one, which is why I recently argued that Democratic candidates should make repairing American democracy a central focus in the campaign by embracing policies that reduce the influence of big money, curb gerrymandering, and protect voting rights. None of these causes can be achieved without a sympathetic Supreme Court. In September Rick Hasen wrote a great piece arguing why the future composition of the Court was the most important civil-rights issue of our time. It’s now the most important issue, period.